I grew up wishing for hills and trees instead of the gently rolling prairie of my upbringing. I toyed with the idea of moving to Asheville, North Carolina. I killed loads of fragile plants and trees trying to grow what I thought was beautiful. But then I nearly cried on the way home from England to see tallgrass waving against barbed wire fences on the in-flight movie, set in the American West. I had no idea how much I had missed my own landscape. Cattle instead of sheep. Craggy, stunted trees that had scrabbled a hard living out of clay and limestone. Farmponds. Hayfields. And a limitless sky. There’s nothing like the prairie sky. I still get a thrill now, when I see it. And strangely, it was living in England that taught me that. Fashionable as is has become in Europe to use prairie grasses that to my native eyes look like just good grazing pasture, they seem bereaved without their sky. (I will never get over seeing switchgrass for sale in a nursery. In a nursery. With a price tag. If I just don’t mow, my acres will grow up all switchgrass.) And it is why my preference is not for the enclosed garden rooms of Sissinghurst or Hidcote, where I felt an urge to tear down the hedges that was unworthy of a garden historian. Give me the vista, the wide view to the sky. Don’t fence me in. The English landscape is uniquely defined by its (often ancient) enclosures. The landscape of America is defined, largely, by the absence of them. It’s right, I think, to honor your personal landscape. Much as I love them, I will not be making an enclosed English garden on my prairie plot. Oh I know what you mean. I've lived in OK, MN, IN, OH, NE (and England), and feel the same way. I hated the midwest / plains gorwing up, I especially hated Oklahoma. Still do. However, I keep writing about it, my langauge SOUNDS like the rhythm of life in these places, my sensibilites are, well, midwestern. I always wanted to live in a forest overlooking a lake with mountains or hills in teh distance--but that's like and English garden, too. I need to see what's coming, get ready for it, prepare myself, whether it be a storm, illness, new job, geese, or flowers. I can so identify with you ... it took me 16 years of living in eastern Canada before I could finally come home and breathe! There is something about prairie skies that stays with you no matter how far you travel or how much you long for warmer climates. Being back under them feels good. I grew up in suburban and rural New England. Our sky peaked through openings in the trees so home for me is canopied. 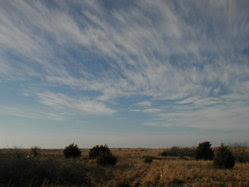 It is also open like your prarie but you have to walk a beach or climb a mountain to view an expansive sky. A prarie sunset must be a great treat.